The Kuwait Real Estate Investment Consortium is one of Kuwait’s leading companies. The Consortium is responsible for the application of business strategy, achieving results both for its own portfolios and those of their clients from astute international investment. 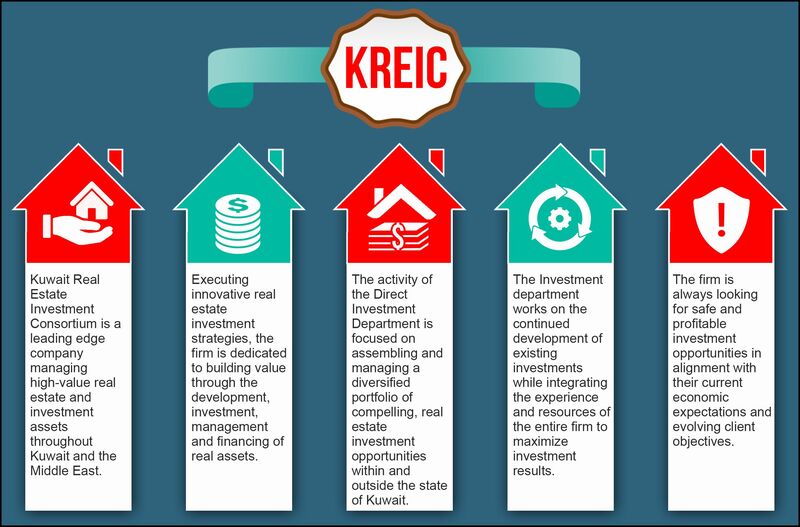 The Kuwait Real Estate Investment Consortium’s Investment Department focuses on attaining a strong competitive edge, whilst maintaining strong business principles. Fahad Al Rajaan’s Bloomberg profile investigates this concept in more detail. The Investment Department is responsible for the continued development of current investments according to economic events and trends in collaborating with others to establish companies. The First Real Estate Fund was established on 17th September 2002 as a real estate and investment fund. The goal of the fund was to invest in real estate trade and development by buying, selling, trading and leasing. It is in this way that the First Real Estate Fund provides an opportunity for smaller investors to invest in real estate. In addition, the rising plot trade has reaped financial gains within the State of Kuwait itself. The Consortium’s real estate portfolio consists of a wide range of investment properties distributed in some of Kuwait’s most important trading areas and residential districts. Managed by the Investment Department, the commercial sector was valued at some 19.8 million Kuwaiti Dinars in 2014, with the residential real estate arm valued at 7.6 million Kuwaiti Dinars. The Kuwait Real Estate Investment Consortium owns a 24.39 stake in the Arab Ceramics Company (also known as Arasemco). The Arab Ceramics Company was founded in 1975, producing mainly sanitary ware. Today, the Arab Ceramics Company is Cairo’s second largest exporter of ceramic tiles and a leading name in the industry. The Company continues to produce various types of tiles and sanitary ware, exporting to the Gulf States and North Africa, as well as parts of Europe. Ali S. Al Ghunaim (General Manager). Turky Zaid Al Fahad (Manager of the Compliance Unit). Ali M. Ali (Administration, Finance and IT Department). Mohammad Al Mijren Al Roomi (Manager of the Investment Department). Ahmad Salem Al Hajri (Manager of the Property Management Department). The Consortium’s upcoming projects include the Sofer/Sharon Project in Lebanon. The Kuwait Real Estate Investment Consortium plan to build a complex of residential and holiday accommodation some 1,350 metres above sea level, approximately 27 km away from Beirut, on the Beirut to Damascus road. The project consists of over 70 villas, six apartment buildings, parking and internal streets in the complex, with pavements, walkways and street lighting. The project includes playgrounds and parks, standby generators to ensure constant source of electricity. It is to be a walled complex, for added security. Kuwait is a small, but very wealthy country located to the north west of the Persian Gulf. Its neighbours are Iraq to the north, Iran to the east, and to the south, Saudi Arabia. It is one of the richest Middle Eastern countries. Of its 2.5 million population, almost half are estimated to be expats. Kuwait is an oil rich state – its estimated 96 billion barrel oil reserve accounting for in the region of 10% of oil reserves in the entire world. Only citizens of the United Arab Emirates, Bahrain, Qatar, Oman and Saudi Arabia are permitted to own real estate in the State of Kuwait. There is a shortage of residential property in the country. The districts most sought after by expats are Jabriya, Hawalli, Samiya and Salwa. Properties become more expensive the closer they are to the sea and city. Apartments are more plentiful on the coastal strip and outside the city; in the city of Kuwait itself, villas are more popular. A Kuwaiti landlord may raise the rent during any given lease period by as much as 100%. The tenant can either agree to the increase, or they must move out. All visitors must obtain a visa, which is available upon arrival at the State of Kuwait International Airport. Other than those arriving from Arab Gulf countries, visitors must be sponsored by either a Kuwaiti citizen or company. Expats in possession of a valid residence permit are allowed to sponsor dependent visitors. A residence visa and work permit are required for an expat to be allowed to work. Employees must prove that they are fit to work by obtaining a medical certificate. Kuwait boasts excellent medical facilities, though healthcare is expensive – it is therefore advisable for visitors to ensure they have adequate insurance. Make sure to check our latest post out about The American University in Washington DC.